Get 25% off of any print (or gallery wrap) of my photos. These make great Father’s Day gifts! P.S., I’m looking for YOUR ideas as to what you’d like to see on this blog. The first 15 readers who follow my blog and send me an email with their ideas will get my MSP Images app for iPhone, iPad, and iPod touch FREE! Click here to send me an email with your ideas. Please remember to follow this blog as well. I’ll email you back with a promo code to download my app FREE on the App Store (a $5.99 value)! My ‘Thunderstorm Over the Gulf Of Mexico’ is a Winner! May 18, 2016 May 18, 2016 by Michael Stebel1 Comment on My ‘Thunderstorm Over the Gulf Of Mexico’ is a Winner! I’m thrilled that my Thunderstorm Over the Gulf Of Mexico won Contest Finalist in ViewBug’s Climate Change Photo Contest! I took well over fifty shots during a late afternoon in early September, as an incredible line of thunderstorms moved in. I was excited by the evolution of this line of storms and how the rain created a misty appearance on the water. This was an HDR image composed from three exposures: -1⅓ ev, ⅓ ev , and 2 ev. I used Photomatix Pro to build a tone mapped image from the three shots and then did a little bit of Photoshop to remove some dots that the raindrops on my lens added to the image. To get a print or gallery wrap (canvas) of this image at a 25% discount, enter coupon code BP516 at checkout. Remember, you can purchase prints, gallery wrap (canvas) on my website. Plus, you can get a personal use license to these and other images along with great discounts on prints with my app for iPhone, iPad, & iPod touch. Gumbo Limbo Tree unprocessed (‘before’ image). 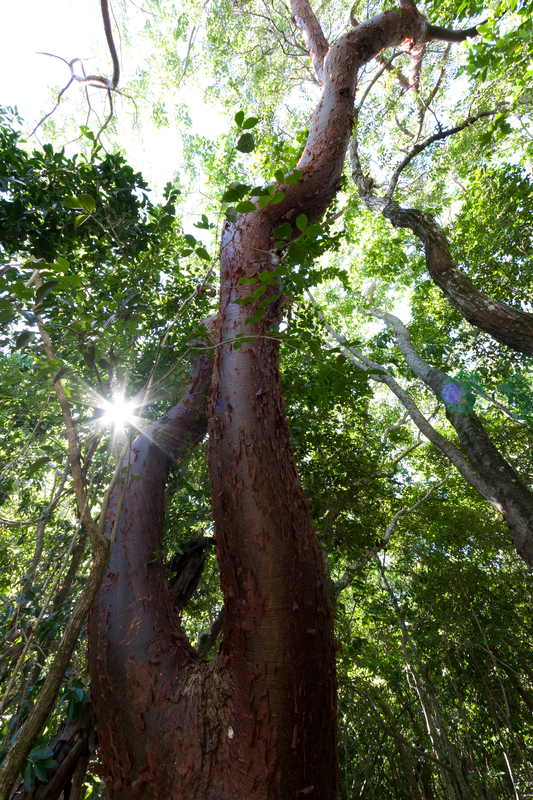 It’s a potentially dramatic image, shot with a ultra-wide 10mm lens to show all of the tree’s forked limbs with the sunlight filtering through the canopy. The problem is that the tree itself is underexposed and lacks much of the reddish coloration I saw when I took the shot. I could have used the HDR technique, which I discussed in a previous post. However, I did not think to do so at the time; and, I only took this single exposure. I also could have used Adobe Lightroom or Photoshop to increase the exposure or otherwise brighten the image. But, that would have blown out the rest of the image, making the leaves, branches, sky and sun overexposed. So, what to do? How about selectively brightening the subject! Make sure the Adjustments panel is displayed and click on Exposure to create a new Exposure adjustment layer. As you can see, the adjustment layer comes with its own layer mask. In the Exposure adjustment properties panel, increase the exposure using the slider. You’ll see that the entire image is brightened. This is OK for now. Adjust the exposure slider until the subject looks close to the way you want it to look. Don’t worry about getting this exactly right. With this technique, you can go back at any time to adjust the Exposure adjustment layer! Now, press Command-I on your Mac (Ctrl-I on your PC) to invert the layer mask that was created for you. The layer mask will now turn all black, thus completely hiding the adjustment layer you just created. Select the Brush tool from the Toolbox or press B. Choose a soft-edged, medium-sized brush from the Brush Picker and set the Opacity to somewhere between 25% and 50% (experiment to see which works best). Press D to set the foreground/brush color to white. Using your mouse or trackpad—a Wacom tablet is a much better solution—begin to paint on the areas of the image you want to add the extra “light” to. Start with one stroke at a time, so as to not overdo it and to avoid making the photo look like it was “Photoshopped.” The areas you paint will show as white “holes” in the layer mask, thus, allowing the Exposure adjustment to come through. You can change the brush size and opacity as you go. Remember: go easy. You want a natural look. Same image using the described Photoshop workflow along with some additional processing. Purchase a print or gallery wrap canvas of this image. One of the benefits of this technique is that you can go back to the Exposure adjustment panel and change the exposure level if you like at any time! As an alternative to creating an Exposure adjustment layer, you can create a Curves Adjustment layer. This will give you more control over the effect you want to achieve, but can be a bit more complex. Experiment with different brushes and opacities. It will take some time to get good at this, but it’s worth it. You’ll love the results! in Natural Light + Off-Camera Flash . Off-camera flash to the right and behind shot through diffuser. Natural light from windows.